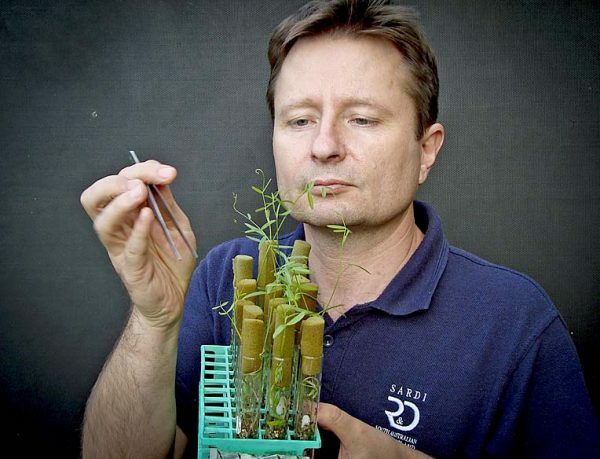 NEW RESEARCH: South Australian Research and Development Institute (SARDI) senior scientist Ross Ballard studies rhizobia growth in lupin seedlings. NEW research is offering hope to grain growers who have been limited in their ability to successfully grow pulse crops on acidic soils in the southern cropping region. New strains of rhizobia with improved acid tolerance have shown promise in field trials, lifting the prospects of commercialisation and a subsequent expansion of faba bean and lentil crops into areas with acidic soils.